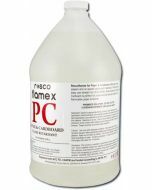 Use Roscoflamex WD to treat wood and cellulosic materials. 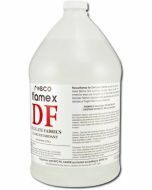 Plywood, board stock, sheet goods, hay, acoustical tile and other common materials can all be rendered flame retardant with Roscoflamex WD. After the Roscoflamex WD treatment has dried fully, wood materials can be painted or stained without affecting the flame retardance. 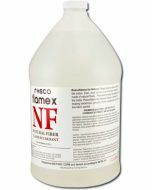 UsageRoscoflamex WD has been premixed and does not require any further dilution. The method of application and the amount of Roscoflamex WD required for sufficient treatment varies with the materials in use. BrushingUsing a wide lay-in brush, brush the Flamex solution into the fibers of the material being treated. Brush in the solution using a criss-crossing pattern to insure adequate absorption. Saturate the material, allow to absorb and then reapply a second treatment. SprayingIn a spray application, it is very important that an adequate amount of the Flamex be absorbed. In calculating the amount of solution needed, remember that a substantial portion of the spray will not fall on the fabric. Use a Hudson-type sprayer with a medium nozzle setting. Saturate the material, allow to absorb and then reapply a second treatment. 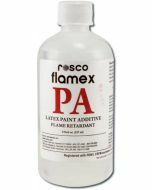 Certification and TestingRoscoflamex WD has been approved for use by the California and New York City Fire Marshall and has been tested according to ASTM E84 Class B.
Roscoflamex WD compares to original Roscoflamex W40. Do not intermix old and new Flamex products.